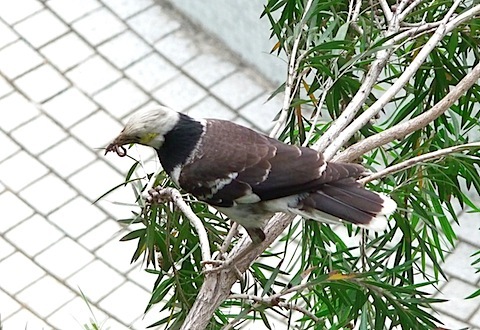 I have not seen the starling 黑领椋鸟 (八哥) chick in the nest for two days. The nest lacked any movement and the parent birds did not fly to the nest anymore. 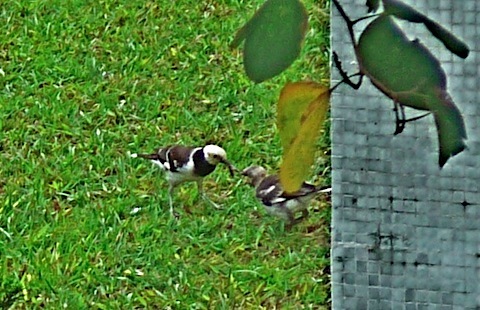 I searched from my window and finally found the chick, so I went to the garden to see it more closely. 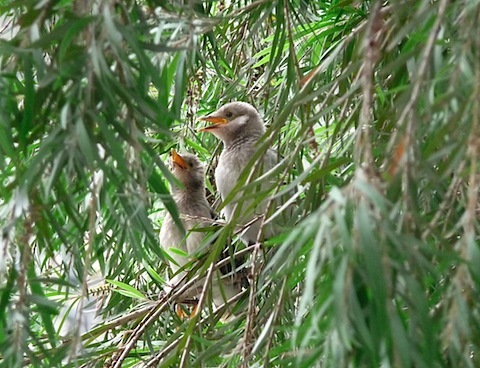 To my surprise and happiness, I found two chicks, now fledglings, perching among the branches of a bottlebrush tree. For all the observations I made at the nest, I saw only one chick at a time. They huddled together and noisily asked to be fed. A parent starling caught a worm and brought it to the fledglings. 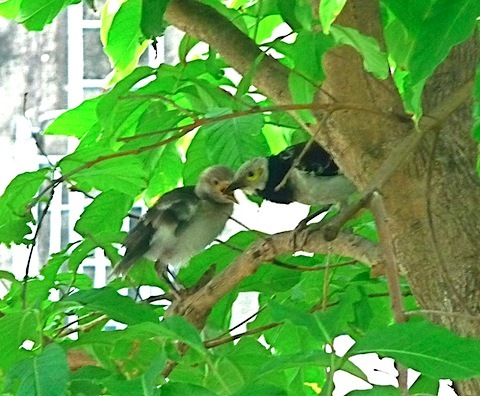 Upon getting together, the parent fed the yummy worm to the fledgling. Soon the fledgling would learn to find food for itself and become a contributing member of the avian society. 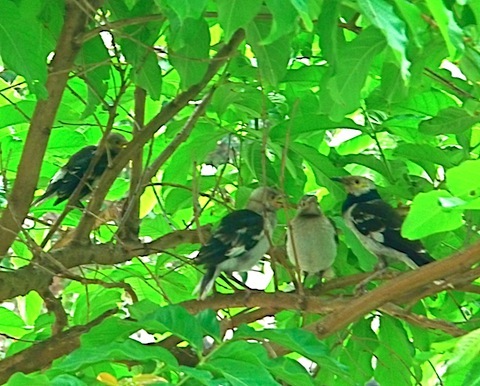 The starling family of four got together for a chat after lunch. Daddy bird was on the right, identified by a white patch on his wing. 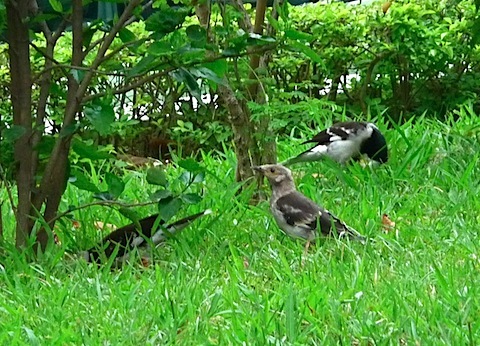 The sibling fledglings were facing daddy, probably asking for advice on finding worms. Mommy bird was on the left, leaving the responsibility of teaching the kids to daddy. If the siblings were one male and one female like our son and daughter, this gathering would be just like dinner-table talks we had in our home. Now that the fledglings have left the nest, they probably would live among the tree branches and never return to the nest. 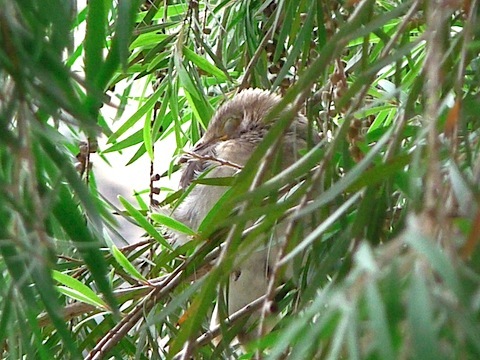 Here, one fledgling took a nap among the branches after it had been fed. Looking out of the window of my empty nest, I can see the starlings’ empty nest on top of the tall tree. 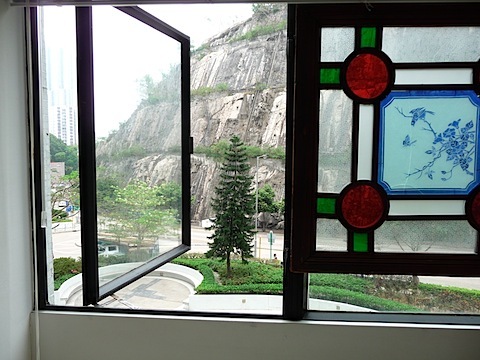 Perhaps the starlings have imprinted themselves onto the cut-glass picture of my Manchu window glass. 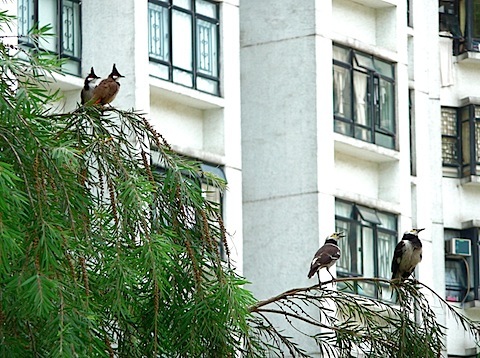 With the nest-tending duties done, the starling parents had time to enjoy the company of a red-whiskered bulbul (红耳鹎) couple. The parents taught a fledgling the finer art of searching for worms among tall grass. And showed the fruit of its labor to a squeaking fledgling. 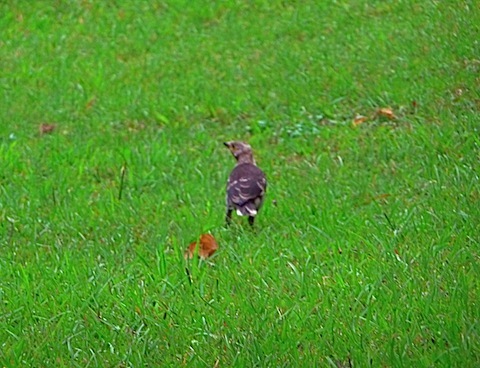 A fledgling seemed lost and overwhelmed on a big pasture as it practiced food foraging skills alone. Posted by Robert Wu on Sunday, May 24, 2009, at 10:09 pm. Filed under Uncategorized. Follow any responses to this post with its comments RSS feed. You can post a comment, but trackbacks are closed.